The four-day hostilities in Nagorno-Karabakh in early April have not yet had a negative impact on the economy of Armenia, according to a World Bank representative in Yerevan. 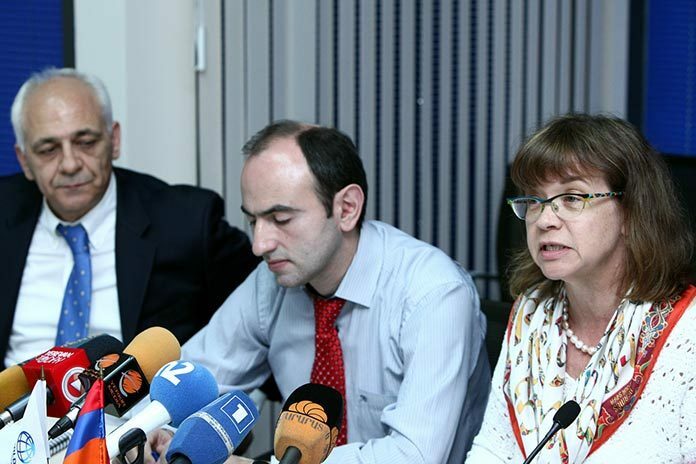 At a press conference on Thursday, Laura Bailey, the head of the WB office in Armenia, said, citing international experience, that it is long periods of armed conflict that usually undermine economic activity by scaring away foreign investors from the affected countries. “We are not seeing any of those kinds of impact [on Armenia] yet,” she said, adding that the World Bank is monitoring this direction. Bailey said that the World Bank has not revised downwards its economic growth forecast for Armenia following the flare-up of violence in the Nagorno-Karabakh conflict zone: it continues to expect that the Armenian economy will grow by 1.9-2 percent in 2016. Minister Minasyan described the escalation in Nagorno-Karabakh as a challenge to the country’s economy, but stressed that the Armenian government is ready to meet this challenge and overcome the difficulties imposed by it. “Without economic advancement and consolidation it is impossible to guarantee the country’s full security. Therefore, it is very important to direct efforts at developing the economy and attracting investments,” stated Minasyan, a member of the Armenian Revolutionary Federation (Dashnaktsutyun) party that signed a political cooperation with the ruling Republican Party of Armenia in February. “We should double, triple our efforts to attract investments and raise our trade to a due level,” the minister added, announcing upcoming amendments in the law on foreign investments aimed at fully protecting the rights of investors. Unlike the World Bank and the Armenian government, some economic experts in Armenia believe that the war will not pass without consequences for the economy, especially that its risks aggravate the already existing problems that hinder the flow of investments into Armenia. Economist Vahagn Khachatryan, who is affiliated with the opposition Armenian National Congress party, thinks that even purely from the economic point of view Armenia is not a country favorable for investments. “We are a country which is in a de-facto state of war, our tax system is not favorable, corruption here looms large and the environment is not favorable for business as there is protectionism. We cannot speak about new large-scale investments until all these problems are solved,” he said. Economist Karlen Khachatryan shares this opinion, too. He thinks Armenia’s economy will both directly and indirectly bear the negative consequences of the Karabakh war. “Indirect consequences of the war could be even greater than direct ones,” he said recently.